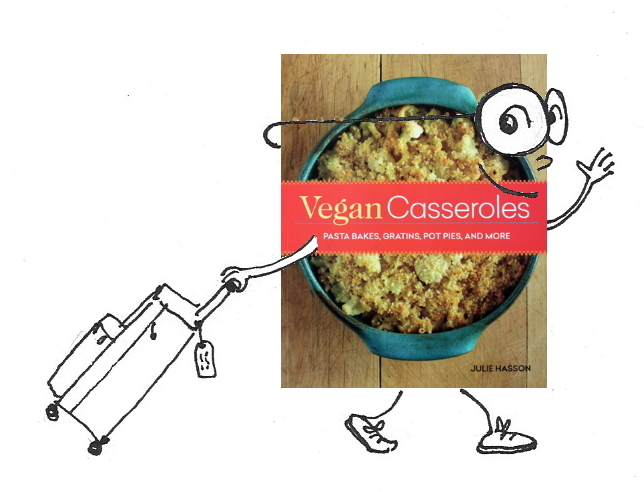 By now I'm sure you've heard some of the buzz about Julie Hasson's newest book, "Vegan Casseroles." Julie is quite a dynamo - she's written loads of great cookbooks (including one of my favorites, "Vegan Diner"), she used to run a vegan food cart in Portland called Native Bowl (yum! ), and now she's busy launching a vegan & gluten-free baking mix called Julie's Original. Somehow, in the midst of all that, she also wrote this excellent casserole book. Casserole recipes are often super heavy on the eggs and dairy - since they rely on those ingredients to bind everything together. 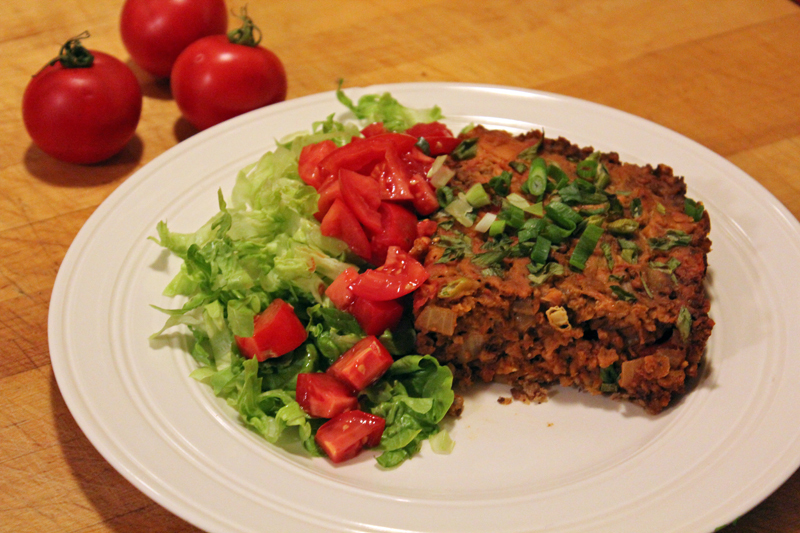 It's so fun to finally have a whole book of vegan casserole recipes! 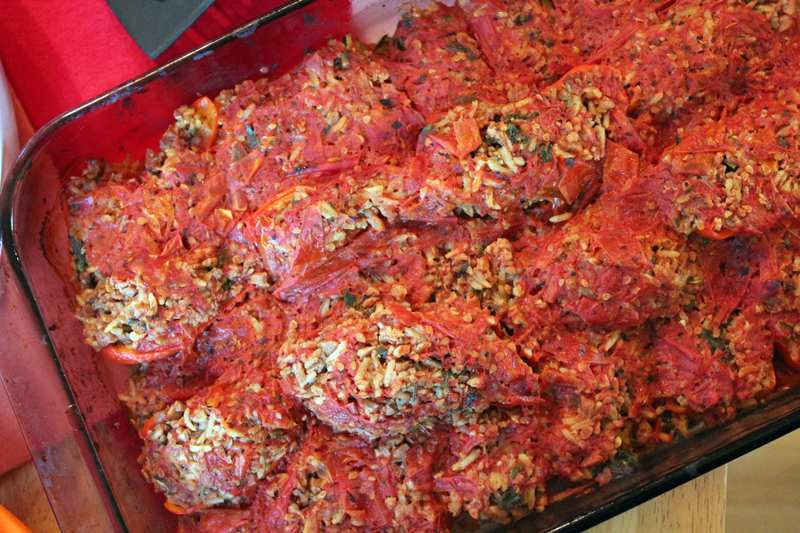 The first recipe I tried was the Italian Stuffed Peppers with Fennel and Garlic. This recipe called for TVP (texturized vegetable protein), which I hadn't used in years! Combined with some cooked rice that I already had on hand, this whole thing came together in no time at all. The flavors were absolutely delicious - I especially loved the fennel seeds in spice mix. I made this dish on a day of the week when I don't typically return home from teaching until later in the evening. Casseroles are so great that way. I made it ahead of time, and had Mr. VE&T pop it in the oven at the appointed time. And then I came home to a delicious dinner! The recipe says it will make you eight halves, and I only got seven. That said, I picked out some pretty giant bell peppers, so I wasn't surprised. We enjoyed these for dinner two nights in a row, plus I had some for lunch for a few days after that. I loved that this dish came together quickly, was packed with protein, was quite low-cal, and made a ton of food! In fact, Mr. VE&T loved these stuffed peppers so much that he made a batch all on his own for our recent rainbow potluck! He used little mini bell peppers for that occasion and made about 30 halves with the mini peppers. Like a lot of recipes in this book, you can take the "make it from scratch" route and make your own pasta sauce (she provides a recipe), or you can take the "I want something super easy" route and use store-bought sauce. Next up on my list of recipes to try was the Creamy Spinach Florentine. Oh dear, this was SO GOOD. The sauce recipe made a ton of sauce and I thought it was going to be too much... but once you mix it all together, the result is a super creamy and rich casserole dish that was not lacking at all. The sauce also calls for sherry and nutmeg, both of which imparted a more sophisticated flavor to the dish. The recipe suggested using frozen spinach, but I'd rather use fresh spinach, so I just steamed up a pound of fresh spinach and chopped it up. It definitely seems to me that these recipes are easily adaptable and quite versatile. Even Mr. VE&T who is an eager omni eater totally loved this and said "I couldn't have enjoyed this more if it had been made with cheese!" This dinner was a bit more indulgent than my average weeknight dinner, but seriously, no regrets. I loved it. After I made it I also saw that Julie gives an option to reduce the cashews in the sauce a bit, so maybe I will try that variation next time. There are a load of mac and cheese type recipes in "Vegan Casseroles," and I think I will slowly try my way through them all. For years now I've pretty much avoided vegan versions of mac n cheese, but this dish totally lured me back in. Next up we'll probably try the "Boozy Baked Penne with Caramelized Onions." Doesn't that sound crazy good?? One of the best things about casseroles is how you can throw a bunch of stuff in one dish, pop it in the oven, and then feed an army. Recently we had 6 family members over for a special dinner (my mom's birthday, actually!! ), and I thought it would be a perfect time to make another casserole. I made the Chickpeas with Rice, Dill, and Tomatoes, and it was a big hit. The ingredients are mixed with a creamy tahini sauce and then baked. I couldn't stop myself and used extra tomatoes. This dish had really excellent flavors - light, fresh, and tangy. We served this with a giant side salad and then some birthday dessert for my mom, so it was just great. That said, this was a lighter dish, and in my opinion, needs a salad or another side dish to be just right. Everyone loved it - including the healthy-palette folks and the not-at-all-health-oriented folks, so that alone makes it quite a winner in my book. It's also worth mentioning that the book is very friendly to gluten-free folks, especially since Julie herself has been gluten-free for a few years now. The result is that almost all of the recipes in the book are either naturally gf, or easily adapted to gf needs. Taco Casserole - straight out of the oven! all served up and ready to eat! The last recipe I've made (so far!) was the Taco Casserole. This recipe also called for TVP, and came together really quickly - just a matter of minutes really! It called for vegan cheese, but I don't keep any vegan cheese around. Instead I had some homemade noochy queso sauce that I poured on top and that was a nice addition. We got four hearty servings out of this dish. The serving suggestion of lettuce and tomatoes was a really important part of the final presentation. It was nice to have something so crisp and fresh like the lettuce along with the spicy, meaty casserole. In fact, next time I think I will make even more veggies to go with it, since unlike the other recipes I tried, this one didn't have that many veggies in the recipe itself. Vegan Casseroles has a variety of rich and creamy casserole recipes, along with some that are lighter. Some of the recipes call for pre-made ingredients like "vegan sour cream," or "frozen hashbrowns," or "vegan cheese." If you're like me, and don't usually buy many products like that, obviously you can skip those recipes or just skip those ingredients - or knock yourself out and make the same thing from scratch. That said, there are some really amazing "from-scratch" sauce recipes in this book that are truly delicious and that don't require a ton of effort or weird ingredients. I think almost everyone is guaranteed to find a few standby recipes in this book that they will really love and will come back to again and again. I'm glad to have this book, especially because it's hard to find tasty and reliable vegan casserole recipes. Casseroles are so great for holidays, potlucks, big gatherings, or when you want to cook on the weekend and eat all week. This book definitely meets those needs and I'm looking forward to trying a lot more of the recipes. #1) I was lucky to receive a copy of the book in exchange for participating in the blog tour... and then publishers accidentally sent me another copy! So, happily for you, I have a copy to give away. I'm happy to open it up to my international readers as well as US and Canadian readers. To enter, just leave a comment here on this post. I'll pick a winner on October 31st (Halloween!). A winner has been chosen! Congrats to Charj! #2) Also, in conjunction with this blog tour, Julie's publisher (Running Press) is holding a special giveaway you can enter to win a Breville Smart Oven, and five runners-up will win a copy of Vegan Casseroles. That's pretty rad. That giveaway closes on November 12th. These look yummy and a great way to get my kid to eat some new foods all mixed in together! fabulous. now i know which recipes to try for sure for my review. the florentine looks so good! Well, I'm sold on the importance of having Julie's latest book in my library. Everything you made looks great, and I love that the recipes are GF friendly. Nice review — you made the book look irresistible! Oh man, I need to try this! Although as a Minnesotan, I will always call it hot dish instead of casserole. I've been on a (small-ish) casserole kick lately, which would have been a huge casserole kick had I had a little more inspiration, so as not to make slight variations on the same 2-3 casseroles over and over again... Thanks to your review, now I know that Julie's book would help me there, with all those fresh ideas for delicious casseroles to try! Yum! Casseroles are a staple for me, especially in the colder months. I can't wait to check this out! They all sound great, but I'm leaning toward the chickpeas and the Mexican casserole. I think my other comment didn't post, that's bizarre. I've been really looking forward to Julie's new book after seeing it promoted on delicioustv.com. Everything I've seen looks fantastic. Yum! I come from the land of casseroles, or as we call them hotdishes! This would be great to have. I haven't made many casseroles since my kids were younger. Now they have kids of their own, and my daughter just had twins. I think making her some freezer dishes would be very helpful. This book looks like it might have some good choices for that. Oh my goodness, yes! Any look at my blog will reveal it: I'm a casserole person through and through. They are what any dictionary should list under the defintion of 'comfort'. Any food is better eaten in casserole form. I love casseroles and all the ones you made look delicious. I would love to win the book. This book is on my wishlist but I would really love to win it! This is a thing I really didn't know about Northern American cuisine - that you have all these casseroles. I don't think it's such a big thing here in Germany, maybe except for the Friday put-everything-in-cover-in-eggs-and-serve-the-vegetarians leftover casseroles. So this books sounds really interesting, Amey! This is the perfect time for casseroles! Wow, the recipes look great! Thanks for reviewing! The taco casserole is making me hungry for tacos. And casserole. The book looks awesome! Vegan Diner is one of my favorite cookbooks. I'm looking forward to getting my hands on Vegan Casseroles. All I want on this cold and rainy day in Boston is a warm hearty casserole! These look AMAZING! I will definitely need this cookbook! 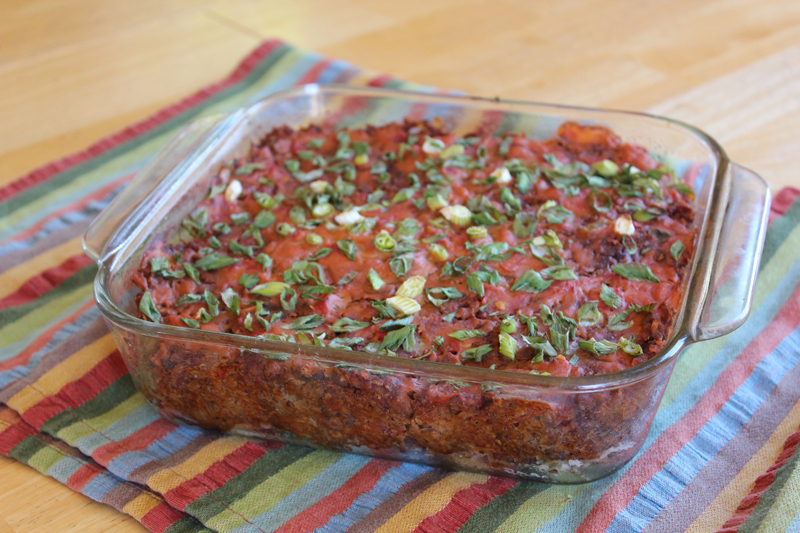 I need more vegan casseroles in my life! That one with chickpeas, tomatoes, and dill looks fab. The stuffed peppers look amazing! Who doesn't love a good casserole. I've heard so much about this book and everything you've made up looks amazing. 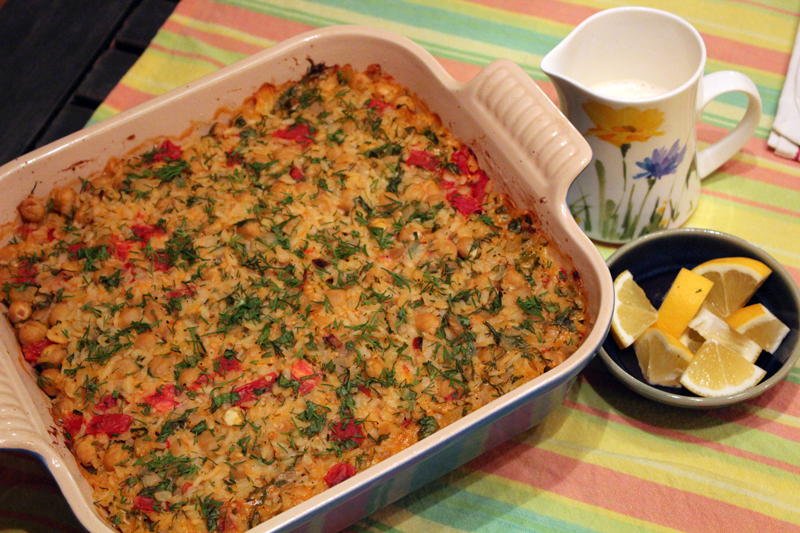 I super love casseroles and the Creamy Spinach Florentine looks especially good to me. I really want to try the baking mixes too, I saw the brownies on someone's Instagram the other day and they looked super gooey and perfect. 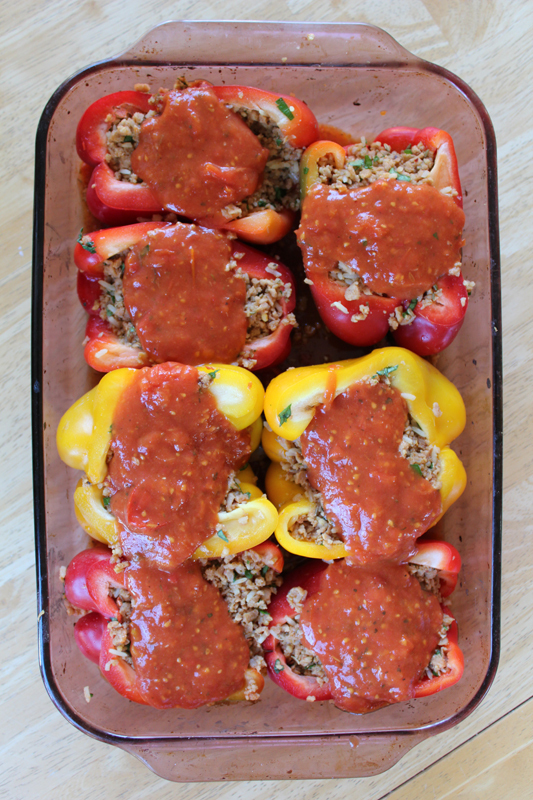 Italian Stuffed Peppers....ahhhhhh.....my mouth is watering! Me and my family want this cookbook so much! Everything you made looks absolutely amazing! This cookbook is definitely on my wishlist! Yum! I haven't made many casseroles since going vegan, this is certainly a book to add to the ever growing wishlist!! Holy moly you have made a lot of recipes from this book already! I just got my copy last week and have been eyeing the florentine. Great review! The Chickpeas with Rice, Dill, and Tomatoes looks amazing! I can't wait to try these recipes. I really enjoy the convenience of casseroles. I'm looking forward to exploring the recipes in Julie's new book. hi! i'm paula from argentina. i'm so happy that you opened an international giveaway! we don't have many vegan books over here so it's very exciting, and this book looks very tempting. Love! i am so excited for this. i'd love to win but either way i am getting this book!!! Yum, these all look so good. I wasn't sure that I was interested in a book about casseroles but the recipes you made may change my mind. Wow, this book looks fantastic! Thanks for the giveaway! I'm always looking for vegan recipes my meat lover husband will eat with me. Looks like this cookbook is the ticket! Thanks for offering your extra copy! 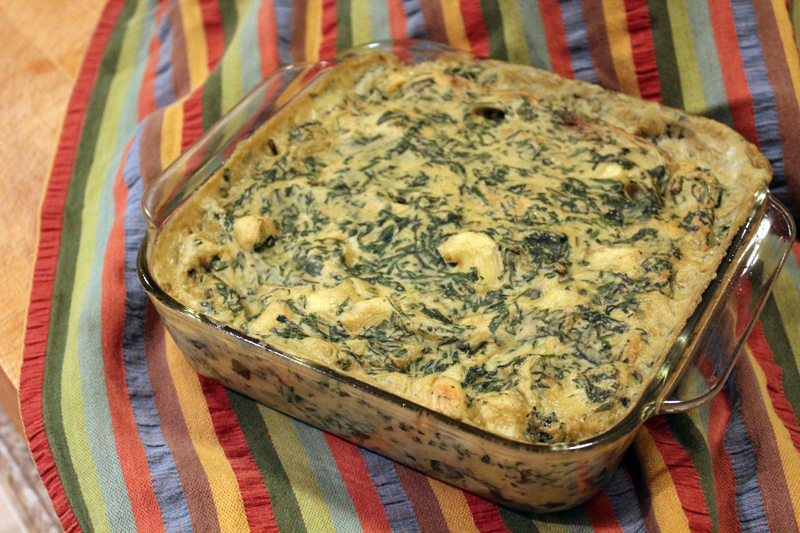 I want to make the creamy spinach florentine casserole, with the fewer cashews option. Thank you for the giveaway; these recipes look fantastic! Mmmm Creamy Spinach Florentine. I am always excited by any vegan 'cream' dish! And with kids casseroles are a dream! everything looks so good makes me hope i win! The taco casserole looks amazing!!! those casseroles look great. I have been thinking casseroles as the weather has turned colder. I like the oven heating up the kitchen and the yummy smells. I made vegan lasagna last week. These look great! I love how casseroles make one big dish usually with a little bit of everything in it. Thank you so much for your offer. Casseroles are great in the fall and winter, so warming and comforting. I also appreciate that your offer is available in Canada too! I love that casseroles feed an army! Also sometimes its nice not to cook for a few days. Yowza! Each casserole looks better than the next, and Julie's recipes are always the best quality -- well tested, tried and true. Me me me. Somer says this book is awesome! Sounds amazing! Now I really regret that I never went to Native Bowl, when I was living in the area. This book looks absolutely gorgeous! I just saw a nacho tots casserole in the index and now I need this cookbook. Plus all the mac and cheese recipes, I'm sold. Wow! These recipes all look great! I think that spinach Florentine has my "try first" vote! My casserole dish doesn't get nearly enough use, this book would certainly fix that!! These recipes look SO good! I really want this book. As a child of the seventies, I grew up on casseroles. Yum. Who doesn't love casseroles? I would be so happy to win a copy of this book! I'm not a cook, so cookbooks help me tremendously. Both my husband and I work two jobs, so casseroles are the perfect type of "cook once, eat several times" meals to help us eat vegan without a lot of thought. I would love to have this cookbook. The fact that it's mostly gluten-free is a major bonus for me personally as I, too, have needed to refrain from a lot of gluten. It all looks beautiful! I'd love to try these (especially the taco and the cheesy ones). I've gotten into a soup/stew rhythm (soup can never be a rut) but my husband asked when we can graduate to solid foods. I would absolutely love to get this book and try the recipes you cooked! They look delish!! Thanks for opening the giveaway to international readers! cheers! Casseroles are the one thing I have yet to master! 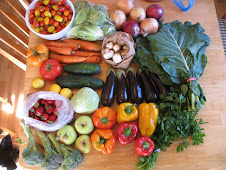 I love the idea of simple, delicious meals that make enough to last all week though! This book sounds like an answer to my dreams ^^. I love casseroles so much! It looks like Julie really nailed it with thin one. They all sound so flavorful! I would be delighted to have this cookbook: I would cook one big casserole dish and have leftovers for the days I'm in a hurry.